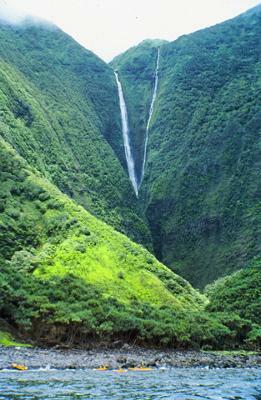 I am extremely familiar with Papalaua Falls. 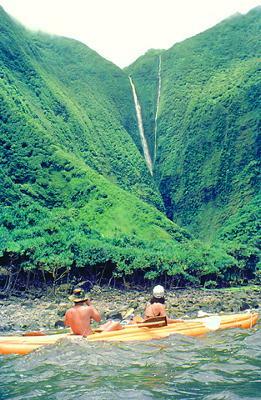 I used to run kayak trips down Koolau, Moloka’i and will again someday. I also made two documentaries including the falls. 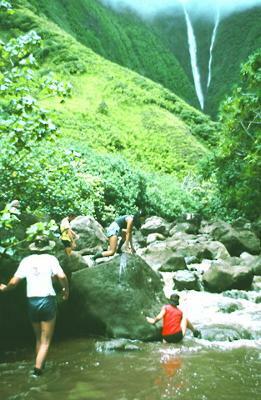 “Moloka’i’s Forgotten Frontier” won a 1985 Emmy Award and the US Outdoor Writers Council “Teddy” for Best Environmental Education production of the year. “Moloka’i’i, Child of the Sea” kicked off the Travel Channel with my “Inside Hawai’i” series. I also have several photos on my website from my “Hurricane John” honeymoon trip of 1995. My wife and I launched in 20 foot surf and hurricane seas. Sorry I can’t give you the URL. Papalaua is 1,250 feet. 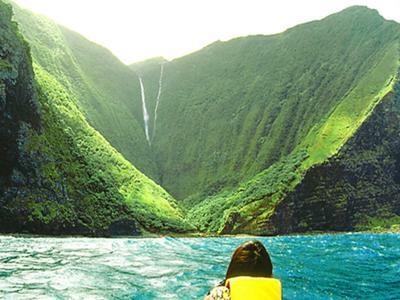 About a mile down the coast is Kawika, much thinner but something like 2,250 feet, Hawai’i’s highest. If you can find both of the above documentaries you will see us swimming in the pool of Papalaua. Here is a shot from the Hurricane John trip. The bay was protected from the really big waves. Excuse these photos. They are 25 years old. 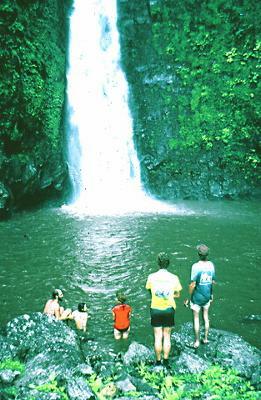 Mo’o – giant man-eatling lizards – are reputed to live in this pool. 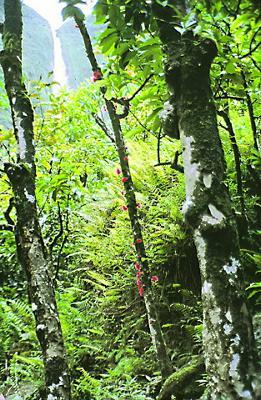 Hawaiian legend says that Hi’i’aka, Pele’s sister, fought a giant mo’o here and while slaying the lizard its tail carved out the valley.